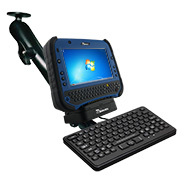 In the warehouse environment, the ability to mount mobile devices and computers to forklifts, trucks, tuggers, and inventory pickers, is essential. From inventory management to order fulfillment, asset tracking, and shipping and receiving, the warehouse floor is complex ecosystem that requires high-efficiency technology to keep it running smoothly. The right technology will help minimize errors, streamline ordering and inventory management, and improve operational efficiencies. 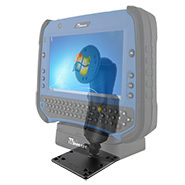 Winmate's full line of rugged, mobile tablets and vehicle-mount computers are built to endure the rigors of the warehouse, and designed to fit seamlessly into forklifts and other warehouse vehicles. From the rugged form factor, designed to withstand shock and vibration, to the powerful processing performance, these tablets and computers enhance warehouse vehicle operation. All Winmate mobile tablets are equipped with vehicle docking for easy mounting to a variety of standard VESA mounts or universal AMPS hole patterns, such as those available from RAM Mounts. 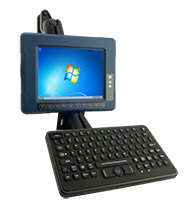 Vehicle operators can also connect an external keyboard via USB to speed up data entry and reduce errors. 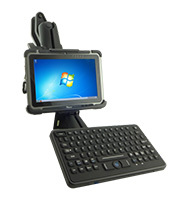 Pictured: The Winmate M9020 7-inch rugged mobile tablet with various mounting and peripheral options. Shown with RAM mount solutions and an external keyboard. 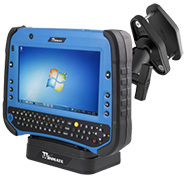 Winmate offers rugged mobile tablets in 7" and 10.1" options, and vehicle mount computers in 8.4" and 10.4" options. These may be securely mounted inside a forklift and other warehouse vehicles and quickly dismounted from the docking to assist in monitoring and tracking inventory information in the warehouse. 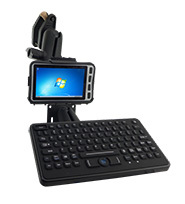 *RAM Mount and Cherry keyboard are sold separately, for more detail please contact our sales rep.